Julie Gross Adelson has devoted her career to the practice of health sciences and health care law as an in-house attorney. She is the Vice President and General Counsel for the J. Craig Venter Institute, a world leader in genomic research with more than 200 scientists and staff, and locations in Rockville, Maryland and La Jolla, California. Prior to joining the Institute in 2006, Ms. Adelson served for six years as Vice President and General Counsel for SoftMed Systems, Inc., a medical records software innovator that has since been acquired by 3M Corporation. 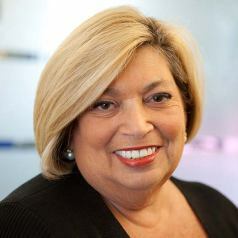 From 1977 to 2000, Ms. Adelson served as Medical Center Counsel for Georgetown University Medical Center which then was comprised of the Georgetown University Hospital, the Georgetown University Schools of Medicine and Nursing, and the Georgetown University physicians practice group. Ms. Adelson received her juris doctor degree from The National Law Center of the George Washington University in Washington, D.C., and her bachelors degree from the University of Rochester.